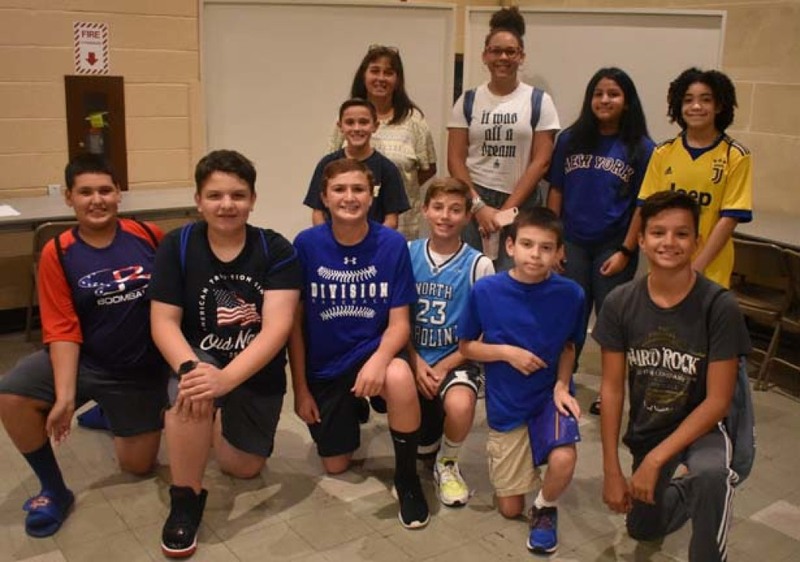 Our confirmation program is a two-year process which is designed to help children and their families make a permanent commitment to belonging to the church and being intentional disciples of Jesus. We who belong fully to the Catholic Church are not meant to be "accidental tourists" but rather deliberate and continual followers of Jesus and members of this amazing, yet often incomplete and flawed, family called "the Church." Early in the autumn, parents and those who wish to be candidates for confirmation come for a delightful and engaging evening which introduces all to the reasons people get confirmed in the church and a review of what the church community looks for in those who will be fully initiated into the church through Confirmation. You'll be assigned to attend one of these during regular class time. What are some good and not-so-good reasons for getting confirmed? In the winter of Level One Confirmation, sponsors are invited to attend a special session to prepare them for their role and then the children who wish to formally become candidates for Confirmation are enrolled at a Mass with their sponsors as we accept them in a Rite of Acceptance. 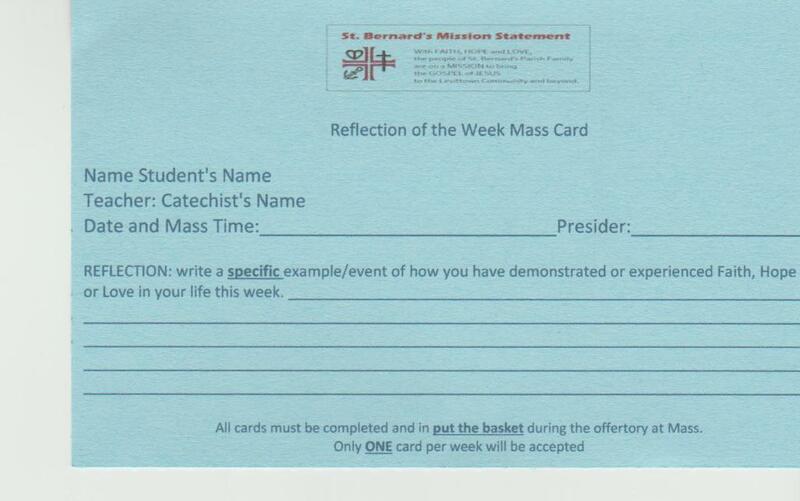 "Blue" Reflection of the Week Mass Cards"
How often do candidates for confirmation go to Mass? Faithful Catholics who are practicing our religion come to church every weekend. It's how we show Jesus we love him and want to belong more deeply to the church family. Yet some families hardly ever come to pray at church. So to encourage them to come and have a good spiritual experience that will help them making a better commitment to come to Mass each week,we require candidates in Level I Confirmation preparation to turn in at least ten cards. Candidates will receive cards with their book at class. For 10 of the Masses, of your choice,Candidates are required to fill out and submit a reflection card in the offertory basket. It is not a good thing to think that once a candidate has collected ten cards that he or she doesn't need to go church again. Ten is not the MAXIMUM number. It's only a start. If a candidate decides that he or she is not ready to come to church each week, that is usually a sign that this wouldn't be a good time to get confirmed because Confirmation means belonging more fully to the church, not less. To everyone who has begun or continued to come to church each week, we just want to say "Good work!" Keep coming and receiving God's blessings. As you'll see below, one of the promises a candidate for confirmation makes is to serve others in the community. There are many opportunities to serve, not only at Saint Bernard's, but through local service organizations. While we ask candidates to account for ten hours of community we realize that service isn't really measured in hours, but in attitude and generosity. We encourage parents to do service together with their children -- as a family, a lot of growth, understanding and unity can come about by serving others together. Look for ways you can help others. Got questions about Level One Confirmation? Click here.